Get the Sim Card for Peru! It doesn’t get much more adventurous than Peru – a country home to crumbling Incan ruins, dense Amazon jungle, deep canyons, arid deserts and rich traditions. If your only picture of Peru is Machu Picchu, you’ll soon discover that this destination offers so much more. If you are a passionate foodie the city of Lima will delight your tastebuds and if you are a historian you’ll find more intriguing Incan ruins than you could possibly visit. Nature lovers will want to get lost for days exploring the biodiversity of the Amazon and adrenaline seekers will be thrilled by the challenge of rafting down class III and IV rapids. give yourself at least several weeks to explore the highlights. With so much to see and do in Peru, you’ll want to give yourself at least several weeks to explore the highlights. So which destinations should absolutely be on your Peru bucket list? Here are some of the most impressive places to visit. You’ll likely fly into Lima, so it’s worth bookending your trip with some time spent enjoying the city. Peru’s capital is colourful and pulsing with energy and has a fantastic culinary and nightlife scene. It has become a gastronomical destination in South America and is the only city to have two restaurants ranking in the Top 10 of the World’s 50 Best Restaurants. The most famous archaeological site in all of Peru, this incredibly location is on the bucket list of most adventurous wanderers – for good reason. Perched on the pinnacle of a rugged, green mountain shrouded in mist above the Urubamba River, the crumbling ruins of this 15th century sacred city have a legendary air of mystery. This mountain retreat was only inhabited for approximately 100 years before it was abandoned during the Spanish conquest, then it was kept a secret until it was rediscovered by American explorer Hiram Bingham. You can take the challenging yet rewarding four day Inca Trail hike to reach the ruins, or visit them on a day trip via bus from the small town of Aguas Calientes at the base of the mountain. Panoramana of Machu Picchu, Guard house, agriculture terraces, Wayna Picchu and surrounding mountains in the background. An elegant colonial city with a large central square and a conical volcano towering in the distance, Arequipa is certainly worth a visit on your Peru travels. Many of the beautiful, baroque style buildings were made from white volcanic rock from the mountains. Although Arequipa receives frequent earthquakes, this natural rock building material makes the structures resilient. Be sure to visit the stunning Basilica Cathedral, which is a UNESCO World Heritage Site and one of the most impressive architectural wonders in the city. Also, Arequipa has joined Lima in offering some of the best cuisine in Peru. Some of the classic dishes served here include ocopa (a potato in creamy, spicy sauce) and rocoto relleno (a stuffed pepper). Believe it or not, this natural wonder is twice as deep as the world-famous Grand Canyon. It’s an absolute must for any adventurous visitor to Peru. 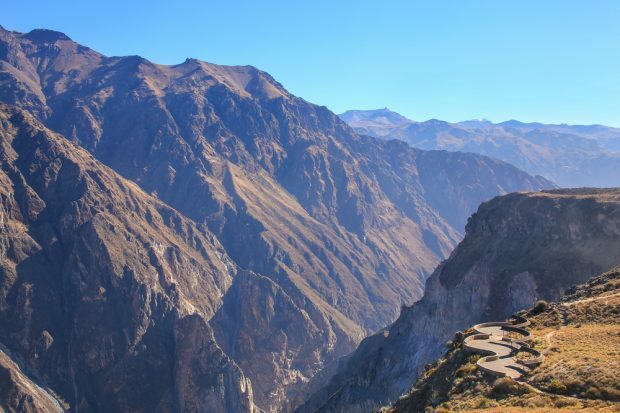 At the top of the canyon you’ll find dusty, dry villages with adobe houses and Andean Condors soaring above on the warm thermals. As you hike down the twisting switchbacks the landscape will change, the desert landscape becoming greener and more alive. At the very base of the canyon you find yourself in a cool, green oasis listening to the sound of rustling leaves and the river rushing over rocks. The canyon bottom features a simple yet lovely hotel with simple stone huts, a swimming pool and plenty of hammocks – so you can stay as long as you like. If you don’t feel like tackling the climb back up, local porters offer a donkey ride service. Mirador Cruz del Condor in Colca Canyon, Peru. It is very popular viewpoint for spotting Andean condors. The Urubamba Valley is also known as the Sacred Valley of the Incas and it is one of the most culturally significant regions of Peru. The rugged hills of these highlands are strewn with crumbling ancient Incan ruins and centuries-old traditions are still alive here. The valley stretches all across the Andes, following the course of the Urubamba River. Throughout the valley you’ll find towns and historic sites including Ollantaytambo, Pisac and Calca. This entire region was once a spiritually significant area for the Incas and it is the ideal place to learn about the history of this fascinating civilisation. This destination is also popular with adventure travelers and a popular activity is to go white water rafting down the class III and IV rapids on the Urubamba River. There are great local companies that will outfit you with a helmet and gear and guide you down the river. 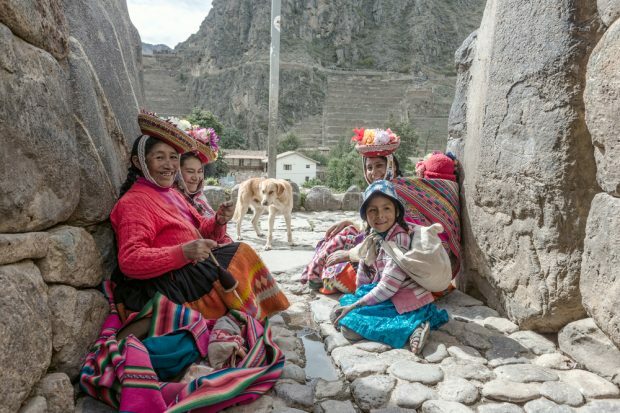 One of the most intriguing and picturesque villages in the Sacred Valley of the Incas, Ollantaytambo was once a stronghold of the Inca resistance against the Spanish. 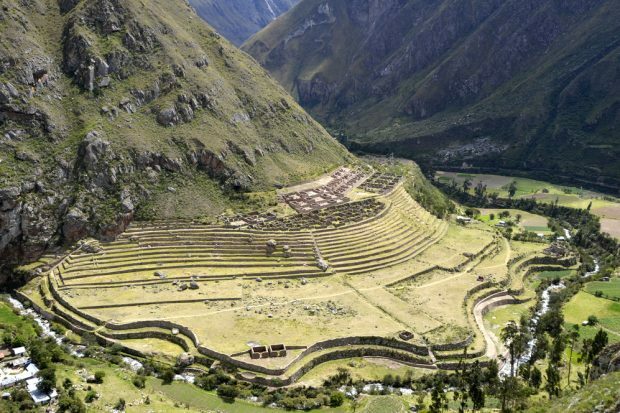 It is now known for being the starting point for those who want to hike the Inca Trail, as well as a lovely peaceful village rich with Peruvian culture. It is home to some of the oldest continuously-occupied buildings in South America and they are remarkably well-preserved. You can also visit the ruins of Ollantaytambo, which are of religious significance and were used as the largest defensive structures near the plains below where the Incas defeated the Spaniards in battle. There are fascinating tours that will reveal the history of these ruins. 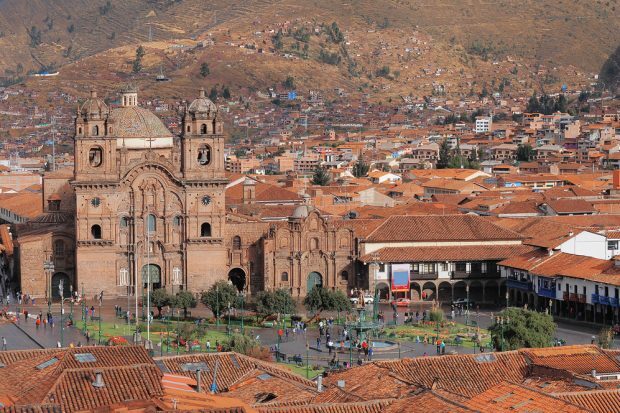 Located on a perch high in the Peruvian Andes, Cusco (sometimes also spelled Cuzco) is a must-see on your travels around Peru. 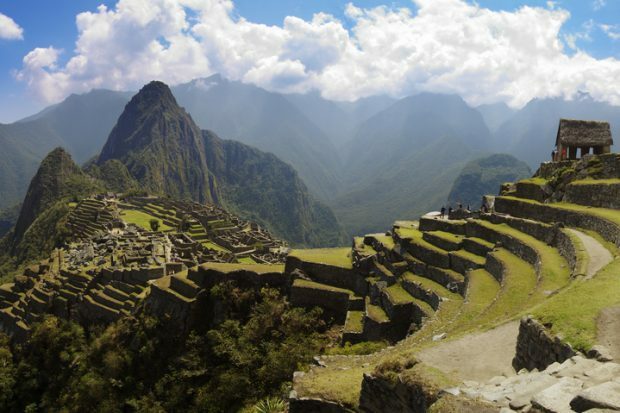 It is the former center of the Inca Empire and one of the largest tourist attractions in Peru. Hang out in the Plaza de Armas, which is the main square and the cultural center of the city – surrounded by bars, restaurants and coffee shops. Also, don’t miss the San Pedro Market, which comes to life with fruit, vegetable and meat stands. Arrive as early in the morning as possible so that you get first pick of the freshest produce. Be sure to check out the chocolate museum – if you want to learn to make your own chocolates they offer fun and delicious interactive workshops. You can also stop for a drink at Paddy’s – the highest Irish owned pub in the world and a popular spot for backpackers and expats. Central square In Cuzco, Plaza de Armas. Peru. Puno is a fascinating cultural hub of Southern Peru, located on the shores of Lake Titicaca (a lake so large it feels like the ocean). Although the city has plenty of modern architecture, traditions run deep and you’ll still see many locals clad in the region’s colourful clothing. Take a trip to the Uros Islands, fascinating floating islands made from totora reeds. You can actually stay within the homes of the locals and get a taste of what their traditional lives are like. You can also take a stroll down Jiron Lima, the main pedestrian thoroughfare in the city, lined with excellent bars, restaurants and cafes. Although when you think about Peru’s landscape you might picture mountains – in fact 62% of the country is covered in jungle. The Amazon rainforest is a stunning wilderness to explore, teeming with over 14,000 species of animals and 20,000 plants. The best way to immerse yourself in the Amazon is to take a multi-day trip which includes lodging, guidance, meals and boat transportation. Don’t forget to bring long pants, insect spray and boots for hiking through muddy areas. You’ll stay in a simple lodge and go walking in the rainforest, a fantastic opportunity to see animals such as the giant river otter, Amazonian tapir and 14 different species of monkeys. One of the best places to visit is the Parque Nacional Manu, which is a national park that is alive with many species of wildlife. A popular jumping off point for Amazon adventures, Iquitos is the largest city in the world that is not connected by road. Yes, that’s right – you can’t just drive there. The only way to get there is to travel by plane or to take a three or four day riverboat journey. Just getting there is an adventure, but exploring this unique city is pretty interesting as well. Visit the Belen Market, where you will find everything from potions made by witch doctors to odd-looking fish from the Amazon river to edible worms and spiritual healing remedies. There’s also a beautiful beach at Quistococha where you can lounge on the sand in the middle of the jungle. These are some of the most incredible destinations in Peru – so make sure that you include them on your itinerary when visiting this amazing country. Travelsim keeps you connected in Peru. 1GB data only for €18.